The expansion of the Panama Canal, dubbed “Panamax,” will significantly effect trade routes and supply chains for generations to come. Florida business and commercial real estate will benefit greatly as our state becomes more incorporated into global supply chains. Panamax is the term given to the expansion of the lock systems located along the Panama Canal scheduled for completion in 2015. The idea here is that larger locks allow larger ships to transport exponentially larger quantities of product at less costs. According to David Hummels, professor of Economics at Purdue, ocean shipping constitutes 99% of worldwide trade by weight and volume. In the Big Picture, scale clearly matters. The current maximum size of vessels allowed to use the canal is 4,400 TEUs (Twenty Foot Equivalent Units,) a standard unit of measurement for the shipping industry. This term comes from the size of one 20ft x 8ft metal container box. The new lock sizes will enable the allowable ship size to increase nearly 170 percent to 12,500 TEUs, a ginormous increase from current capacity. Global connectivity via the Internet has far outpaced the world’s ability to provide the infrastructure required to efficiently facilitate trade across global supply chains. This results in empty containers and circuitous routes around continents. The Internet is also radically changing the buying behavior of consumers and distribution of product. The International Council of Shopping Centers estimates that e-commerce currently comprises 8 to 10 percent of total retail sales, and predicts that number will increase to 30 percent in coming years. People are touching and feeling product in traditional retail outlets, only to purchase from their smart phones with the lowest cost provider who could be located anywhere on the planet. This will have a dramatic effect of how merchandise is moved within and between countries. Most see Panamax as a good thing for all ports in the Southeast. 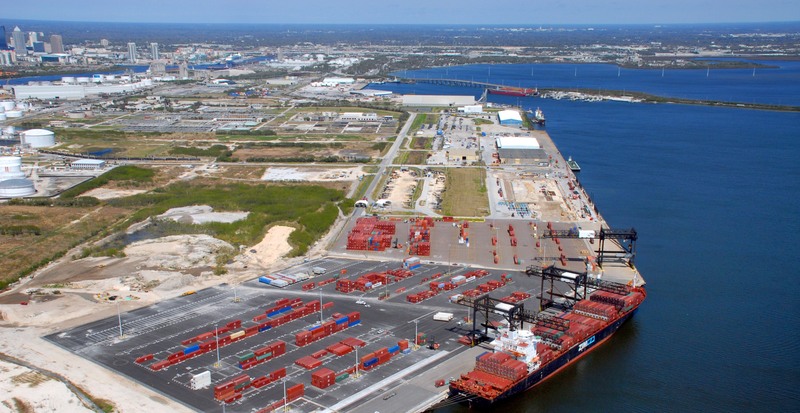 Port cities like Norfolk, Savannah, Charleston, Baltimore, Charleston, Jacksonville, Tampa and Miami are all assessing their current channel depths, rail service, cranes and customer bases in light of the expansion. The 12,500 TEU ships require about 50ft of depth and cranes large enough to support the massive ships. While some communities are investing significantly to update their infrastructure to accommodate these(Miami and Jacksonville), others are trying to determine which trade routes and supply chains to specialize in without enlarging their infrastructure. Florida is unique in the sense that as a state, we have more ports than any other state in the country, but handle less than one million TEUs a year. That’s a small fraction of the 45 million TEUs that come through North America each year. All modes of transportation are fully engaged in preparing to benefit from post-Panamax supply chains. Shipping, Air, Trucking and Third Party Logistics (3PL) firms all stand to benefit from anticipated increases in freight volume and velocity. In Florida, intermodal service providers like CSX are investing billions in new terminal locations like the one in Lakeland, FL. FedEx is investigating new distribution facilities in cities like Ocala and Jacksonville, positioning their resources to more efficiently move merchandise between ports and the interior communities they serve. Private industry is benefiting from the fierce competition between communities who desperately seek to attract firms and help spur investment and job creation. Communities are well aware of the huge benefits companies bring when private enterprise invests it’s capital, creates jobs and attracts other businesses into a community. Governments are quick to respond to opportunities by offering land, infrastructure, tax breaks and cash to companies willing to locate to their communities. And underneath it all is the real estate. Many large cities have their hands tied by the scarcity of entitled land available to accommodate the industrial infrastructure required for distribution, manufacturing and logistics. Industrial development firms like Duke Realty, Pattillo Industrial Group, Rockefeller Group and DCT Industrial are working on delivering warehouses, cross docks and other facilities to support post Panamax supply chains. Smaller communities with close proximity to ports, rail lines and interstate highways will benefit from Panamax. Ocala is a great example. Located on I-75 in the middle of the state, Ocala is a perfect distribution point for the Jacksonville, Tampa and Orlando markets. CSX is beefing up it’s lines through the community and local government leadership is driving infrastructure improvements with overpasses, water and sewer services. The Ocala CEP (Chamber and Economic Partnership) is also aggressively working with existing companies (RL Carriers) and potential companies (FedEx) to help grow business opportunity as it participates in the global supply chain.